"A flight of the historical imagination that will leave readers dazzled." - Thomas Fleming "Solid research buttresses Poyer's latest, a consistently engrossing WWII novel featuring FDR and skinny naval officer John Fitzgerald Kennedy." - Publisher's Weekly "An assassination thriller that keeps the pulses pounding, a finely crafted blending of fact and fiction with the patrician president from Hyde Park as the target..." - The Tampa Tribune "A consistently readable, fast-paced, intelligent tour of the elite politics of the U.S. as World War II drew to a close." - Booklist The apocalyptic spring of 1945. A young Navy lieutenant, convalescing from action in the Pacific, is transferred to the President's personal staff. But John Fitzgerald Kennedy's boss, Admiral Leahy, thinks enemy code traffic points to an assassin in FDR's circle. Who is trying to kill Franklin D. Roosevelt? JFK and screen star Lauren Wolfe, "the most glamorous woman in the world," pursue the mystery as the clock ticks down to April 12, 1945, in Warm Springs, Georgia ... where two ruthless men-one Russian, one German-and a shadowy American traitor will try to alter the course of history. 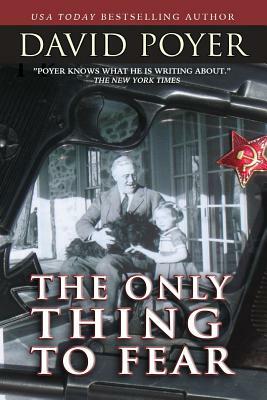 Set against a burning Berlin, the glitter of Palm Beach and Hollywood, the killing fields of Poland, wartime Washington, and small-town Georgia, The Only Thing to Fear brings legendary figures to fierce and passionate life. Using hundreds of hours of on-site research, interviews, and declassified documents, a master storyteller reimagines our country's heroes in a way that is sure to provoke fascination and controversy. Millions of copies of DAVID POYER's forty-plus books are in print, including The Med, The Gulf, The Circle, The Passage, Tomahawk, China Sea, Black Storm, The Command, The Threat, Korea Strait, The Weapon, The Crisis, The Towers, The Cruiser, Tipping Point, and Onslaught, USA Today best-selling novels of the modern Navy and Marine Corps. Visit his website at www.Poyer.com, or follow him on Facebook: Facebook.com/DavidPoyerBooks.